Kent brings broad teaching and administrative experience to RISD coupled with a vision for how we can propel art and design education into new realms of leadership, impact and inclusivity. Throughout the search process, I was continually impressed by his ability to be future-focused while also understanding RISD’s legacies and core culture. Additionally, Kent’s questions and observations reflect his strong natural instincts and distinguished experience in working with both faculty and students. 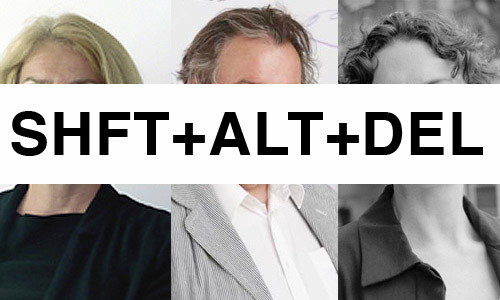 I am excited to work with Kent as our next academic leader to develop opportunities for RISD within the complex and evolving intersections of art, design and the liberal arts. The Nature Lab at RISD is pleased to announce Biodesign: From Inspiration to Integration, an exhibition curated in collaboration with William Myers that marks the culmination of Nature Lab's 80th anniversary celebrations. The exhibition runs from Aug 25—Sept 27 and showcases recent examples of design and art that inform our complex relationship with nature and help us decipher how it may evolve in the future. Major themes of the exhibition will be collaboration and co-creativity, presenting the best practices for working with living materials and with experts across fields. It will aim to inspire, surprise and inform the public, especially in light of the urgent need to make design less destructive to our shared environment. The exhibition of approximately 20 projects will be accompanied by programming including: workshops on building with mushrooms; biotextiles; microscopic silkworm poetry as well as lectures on biodesign, coral reef restoration, the future of food, and more. To launch the exhibition Nature Lab will be hosting a half-day symposium that brings together international artists, designers, scientists and educators for talks, discussions and presentations on topics such as valuing non-human forms of life as collaborators, artistic and scientific modes of inquiry, and ethical considerations in bioart and biodesign practices. The opening of the exhibition also marks the release of the 2018 edition of Biodesign: Nature + Science + Creativity (MoMA). 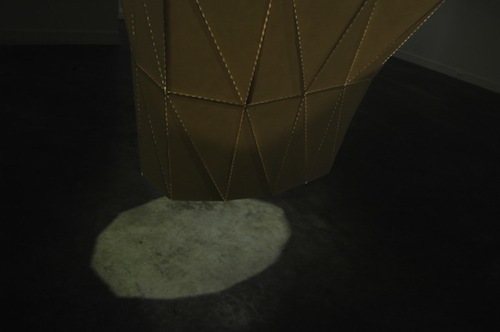 Half-Day Symposium + Opening Reception August 24 Woods-Gerry Gallery Rhode Island School of Design The exhibition features the following works Hy-Fi and Bio-processing Software—David Benjamin / The Living Mycelium architecture, made in collaboration with Ecovative and 3M. Zoa—Natalia Krasnodebska / Modern Meadow Leather grown using yeasts that secrete collagen, and grown completely without animal derivatives. The Built Environment Microbiome, Jessica Green / BioBE Center The BioBE conducts research into the built environment microbiome, mapping the indoor microbiome, with an eye towards pro-biotic architecture. Zea Mays / Cultivar Series—Uli Westphal Newly commissioned corn study, this project highlights maize’s evolution through interaction with humans. Harvest / Interwoven—Diana Scherer Artist coaxes root systems plant root systems into patterns. Fifty Sisters & Morphogenesis—Jon McCormack Artist algorithmically generates images that mimic evolutionary growth, but tweaks them to include aesthetics of the logos of global petroleum producing corporations. Organ on a Chip—Wyss Institute Wyss Institute creates microchips that recapitulate the functions of living human organs, offering a potential alternative to animal testing. AgroDerivatives: Permutations on Generative Citizenship—Mae-Ling Lokko This project proposes labor, production criteria and circulation of capital within agrowaste/bioadhesive upcycling ecosystems. 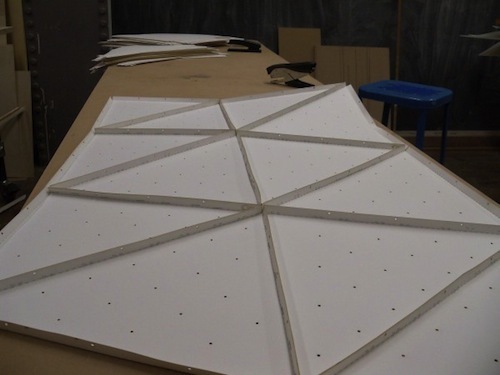 New Experiments in Mycelium—Ecovative Ecovative makes prototypes of mycelium items such as insulation, soundproofing tiles, surfboards, lampshades. Bistro in Vitro—Next Nature Network Performance with speculative future foods samples. The installation will include video screens and a cookbook on a table display. Raw Earth Construction—Miguel Ferreira Mendes This project highlights an ancient technique that uses soil, focusing on how soil is living. Burial Globes: Rat Models—Kathy High This project presents glass globes that hold the ashes of the five HLA-B27 transgenic rats, each one named and remembered: Echo, Flowers, Tara, Matilda, Star. To Flavour Our Tears—Center for Genomic Gastronomy Set up as an experimental restaurant, this project places humans back into the foodchain — investigating the human body as a food source for other species. Blood Related—Basse Stittgen A series of compressed blood objects—inspired by Hemacite objects made from blood/sawdust compressed in a process invented in the late 19th century—highlights bloodwaste in the slaughterhouse industry. Silk Poems—Jen Bervin A poem made from a six-character chain represents the DNA structure of silk, it refers to the silkworm's con-structure of a cocoon, and addresses the ability of silk to be used as a bio sensor, implanted under people's skin. Zoe: A Living Sea Sculpture—Colleen Flanigan Zoe is an underwater structure, part of coral restoration research, that regenerates corals in areas highly impacted by hurricanes, human activity and pollution. Aquatic Life Forms—Mikhail Mansion Computationally animated lifeform works change and evolve based on live data from environments they represent. Algae Powered Digital Clock—Fabienne Felder By turning electrons produced during photosynthesis and bacterial digestion into electricity, algae will be used to power a small digital clock. A Place for Plastics—Megan Valanidas This designer presents a new process of making bioplastics that are bio-based, biodegradable AND compostable Data Veins & Flesh Voxels—Ani Liu This project explores how technology influences our notion of being human from different points of view, with a focus on exploring the relationship between our bodies as matter and as data. Pink Chicken Project—Studio (Non)human (Non)sense/ Leo Fidjeland & Linnea Våglund By changing the color of chickens to pink, this project rejects the current violence inflicted upon the non-human world and poses questions of the impact and power of synthetic biology. Click here to visit RISD Nature Lab. About Rhode Island School of Design Known as the leading college of art and design in the US, Rhode Island School of Design (RISD) is ranked #1 in Business Insider’s survey of The World’s 25 Best Design Schools. Approximately 2,450 students from around the world are enrolled in full-time bachelor’s or master’s degree programs in a choice of 19 majors. Students value RISD’s accomplished faculty of artists and designers, the breadth of its specialized facilities and its hands-on approach to studio-based learning. Required courses in the liberal arts enrich the studio experience, equipping graduates to make meaningful contributions to their communities. Through their creative thinking and problem solving in a broad range of fields, RISD’s 26,000 alumni exemplify the vital role artists and designers play in fueling global innovation. Founded in 1877, RISD (pronounced “RIZ-dee”) and the RISD Museum help make Providence, RI among the most culturally active and creative cities in the region. For more information, visit risd.edu and our.risd.edu. About Nature Lab Founded in 1937 by RISD graduate and long-time faculty member Edna Lawrence, the Nature Labprovides students and faculty with an engaging space for exploring the forms, patterns and processes in nature as well as an understanding of our place within the living world. 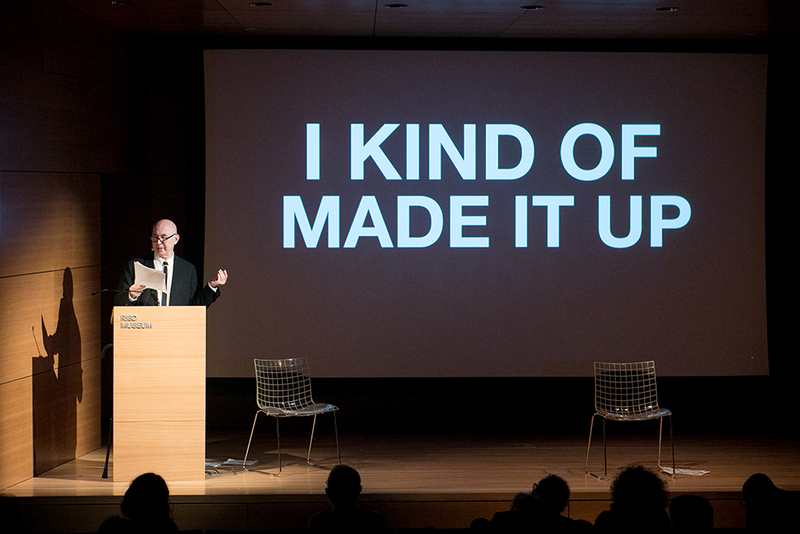 The Lab is a forum, sustained by resources and expertise that inspires countless art and design projects throughout RISD. With more than 80,000 preserved natural science specimens, microscopy and micro-imaging systems unparalleled in an art and design school, as well as aquatic systems and lab equipment for maintaining and studying a variety of living and non-living specimens, the Nature Lab is a unique environment for investigating the myriad connections between art, design and science. The Techstyle Haus is an 800 square foot fabric house that uses 90% less energy thanks to a high performance double skin membrane with integrated PV. Co-founded by Colin Touhey, Todd Dalland, and Robert Lerner, Pvilion is pioneering the design, engineering, fabrication, and installation of flexible solar solutions. For their 2014 Solar Decathlon project—a collaboration between RISD, Brown University, and University of Applied Sciences Erfurt (Germany)—Pvilion provided engineering consulting services on the structural design and membrane roof system. The project team questioned if a membrane roof house could be designed to meet strict passive house energy codes. The answer was a resounding yes—what came to be known as the Techstyle Haus is currently the only fabric structure that meets passive house standards, producing 50% more energy than it consumes. The house was originally constructed in Providence and then disassembled, placed in crates, and shipped to France for relatively easy re-assembly at Versailles. Currently, the Techstyle Haus resides at Domaine de Boisbuchet, the site of an annual art and design workshop, where it serves as a living laboratory and teaching tool as well as student housing. An in-depth video of the design can be viewed here. Colin Touhey, co-founder of Pvilion, said this project is a proof of concept for their flexible, scalable solar solutions. “Given the curvature of the form, the building produces more energy than flat or angled solar arrays.” Techstyle Haus was designed in concept to embrace a double skin tectonic. It’s PV modules are encapsulated in a thin sheet of plastic allowing for a lightweight assembly of shallow curves and folded surfaces. PV’s are typically very labor intensive as each 3’x5’ panel has to be individually wired. Touhey says by eliminating a significant amount of the “stuff” that goes into a traditional solar array can offer design flexibility along with cost savings: "the more that can be integrated into the off-site fabrication process, the cheaper and more effective the system will be. Also, we have found if you eliminate the frames from a PV, if you eliminate the glass from the PV, and if you laminate the PV into a light material, you can ship more of it in one container. All of these variables add up on a very large scale." Building Integrated Photovolatics (BIPV) have become an increasingly significant topic within the advanced building systems design and construction community. Rather than treating PV as an additive system requiring a separate metal support structure superimposed on a building’s roof, BIPV is an evolving practice of incorporating custom solar technology into the constructional logic of a structure. Often, BIPV projects see cost savings through the replacement of roofing tiles or other building elements with photovoltaic panels. 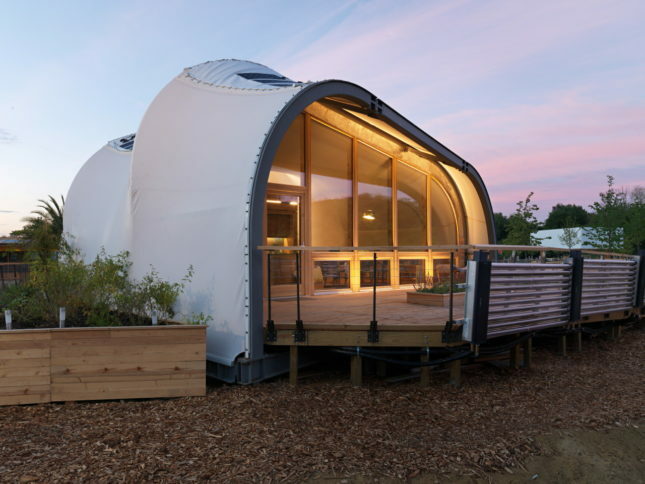 The 2014 solar decathlon was held in Versailles, France, and included 20 prototype structures from 16 different countries. From these projects, 11 prominently utilized BIPV strategies. In addition to Pvilion’s flexible solar fabric, other approaches included cantilevered lightweight shading elements, solar-integrated glazing, a colorful lightweight PV roof, and numerous roof-mounted configurations. In a statistical analysis conducted by a team of researchers at Jaume I University (Castillo, Spain), and published by Advanced Building Skins GmbH, the Techstyle Haus was rated as one of the “most pleasurable BIPV solutions.” Robert Lerner, a co-founder of Pvilion, explains the value of lightweight solar fabric for large commercial applications: “we developed a way to put photovoltaic sheets as a secondary membrane onto a primary membrane. the primary roof skin will almost always be a costly, durable product. Consider a 50 year Teflon-coated glass fabric under very high pre-stress for long spans. Our lightweight membrane can be replaced in 20 years if necessary without affecting the roof below it." Half of Pvilion’s projects are facade-related while half are completely unrelated lightweight temporary and permanent structures—from outdoor clothing apparel to parking canopies and infrastructural projects. Touhey says their goal is to take the Techstyle Haus’ system—an interior skin, exterior membrane, insulation, PV, and wiring – and scale it up to a significantly larger context. Upcoming projects include the Artist for Humanity Headquarters in Boston—a renovation and expansion of and existing building into a structure 5 times as large as the original. Once complete, it will be the first net energy positive large commercial project on the East Coast. The building will feature a solar wrapper that doubly functions as a passive shading element integrated with flexible monocrystalline photovoltaic cells. Other applications include flexible installations on perforated aluminum and warped steel panels, both with free-form perimeters and curved surfaces. Lerner says this is where flexible solar technology shines, “This indicates the freedom of design that is possible while incorporating conventional facade materials." This summer, the Rhode Island School of Design (RISD) launched a new master plan, whose concepts build on a strategic plan begun in 2012 to anticipate future changes and transform the way students interact and learn through the campus's built form. Questions raised included: "How will art and design pedagogy change and how will this impact space needs?" and "How do we build new models of sharing and collaboration?" To carry this out the school is exploring renovations, new buildings, and other physical changes at close to a dozen sites around campus over the next twenty years. It's also reinforcing its commitment to studio-based learning, and strengthening its connection to Downtown Providence and the Providence River. The first facilities to open (this fall) under the new plan are the school's Illustration Studies Building (ISB), a combination of new and renovated spaces, Co-Works, a collaborative digital maker lab in Downtown Providence, and 189 Canal, a renovated building for RISD Apparel, the school's fashion design program. 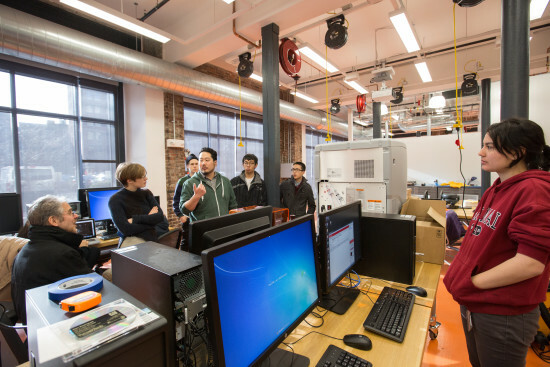 Co-Works, a 3,000 square foot storefront space in Downtown Providence (169 Weybosset Street) encourages interactive fabrication by students in most of the school's departments. The space, formerly a bar in the RISD-owned Fletcher Building, was stripped to its core and re-imagined by Providence-based Durkee, Brown, Viveiros & Werenfels. It contains, among other things, equipment for 3d printing, 3d scanning, CNC cutters, vacuum forming machines, foam cutters, industrial sewing machines. Often usual processes get "hacked" into something completely new, as students rethink how to use software and hardware. "The idea of having a glass artists seeing something a furniture designer or architect is doing is exciting around the circle. It’s become a wonderful lab for innovation," said new RISD President Rosanne Somerson. "To create a space that encourages more crossover was more important than locating these machines in individual departments." ISB, designed by RISD alum Ed Wojcik, updates and reconfigures one of the oldest (and outdated) buildings on campus into 43,500 square feet of advanced studio, classroom, gallery and home space. This includes a five-story, 5,600 square foot addition that opens up each floor and allows for several new facilities. Enlarged and revamped studios are flexible not just physically but digitally, as light colors, for instance, can be set for different types of classes. The renovation of 189 Canal includes new studio, teaching, and classroom space for RISD Apparel students. The formerly-vacant 20,000 square foot building provides much-needed teaching and studio space for an apartment that was formerly housed in the school's Auditorium Building. Responding directly to the master plan's requests, the clearing of that space provided more room for Foundation Studies studios, a computer lab, a general use seminar room, and studios and offices for Film/Animation/Video. "Rather than approaching this from the perspective of a building brief, we're look at what can happen here, and what adjacencies can encourage collaboration," said new RISD President Rosanne Somerson of the master plan. "How can the physical space also activate the curricular space?" Officials with the Chicago Architecture Biennial today announced the winners of the Lakefront Kiosk Competition, choosing a team whose stated goal was “to build the largest flat wood roof possible.” Dubbed Chicago Horizon, the design is by Rhode Island–based Ultramoderne, a collaboration between architects Yasmin Vobis and Aaron Forrest and structural engineer Brett Schneider. Their pavilion uses cross-laminated timber, a new lumber product that some structural engineers call carbon-negative for its ability to displace virgin steel and concrete while sequester the greenhouse gas carbon dioxide during its growth. Ultramoderne's long, flat roof “aims to provide an excess of public space for the Architecture Biennial and Chicago beach-goers,” according to the project description. Their design rose above 420 other entries from designers in more than 40 countries, and will receive a $10,000 honorarium, as well as a $75,000 production budget to realize the kiosk. BP is providing those funds as part of a $2.5 million grant to the inaugural biennial. Three teams—Lekker Architects, Tru Architekten, and Kelley, Palider, Paros—were finalists for the top honor. 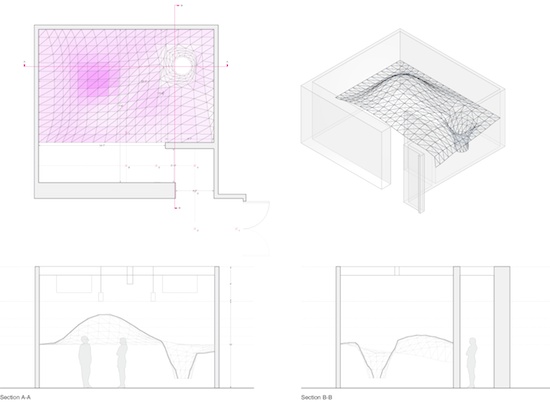 Fala Atelier, Kollectiv Atelier, and Guillame Mazars all received an honorable mention. The Biennial has posted a selection of submissions to the Lakefront Kiosk Competition on its Pinterest page. After the biennial, Chicago Horizon "will find a permanent home in Spring 2016, operating as a food and beverage vendor, as well as a new public space along the lakefront. The Cent Pavilion, designed by Pezo von Ellrichshausen in collaboration with the Illinois Institute of Technology, is a forty-foot tower meant to convey silent and convoluted simplicity. Rock, the kiosk designed by Kunlé Adeyemi in collaboration with the School of the Art Institute of Chicago is a pop-up pavilion a public sculpture composed from the raw and historic limestone blocks that once protected the city’s shoreline. Summer Vault, designed by Paul Andersen of Independent Architecture and Paul Preissner of Paul Preissner Architects, in collaboration with the University of Illinois, Chicago, is a lakefront kiosk that consists of basic geometric shapes combined to create a freestanding hangout within the park. Melissa Feldman has stepped into the role of East Coast Editor for Better Homes and Gardens magazine. Prior to this, Feldman was a freelance design writer whose work appeared in The New York Times, The New York Post, and Azure among other publications. She previously served as Senior Style Editor at House & Garden magazine. Brien McDaniel was appointed Assistant Director of Communications at the Museum of Modern Art. Until July, McDaniel was the Director of PR for architecture firm FXFowle. The Rhode Island School of Design has tapped Pradeep Sharma as dean of architecture. Sharma, who starts this fall, comes to Providence from the Bath School of Art and Design at Bath Spa University in England. 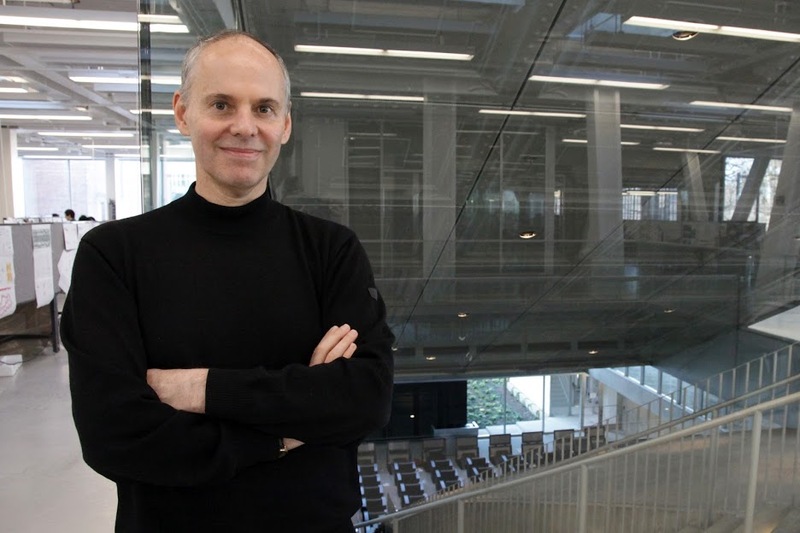 New York School of Interior Design has appointed David Sprouls as president of the college. Sprouls became Acting President in January, following tenures as Vice President for Enrollment Management and Director of Admissions for the school. Venturi, Scott Brown and Associates has officially evolved to VSBA, with president and principal Daniel K. McCoubrey at the helm. McCoubrey leads the firm with principal Nancy Rogo Trainer. French neoclassical architect Étienne-Louis Boullée may have drafted his famous proposal for a cenotaph for Isaac Newton in 1784, but his ideas continue to influence architects to this day, like RISD architecture graduate student, Greg Nemes, whose recent project, Encounter, draws inspiration from the nighttime starlight effect in the interior of Boullée's proposed monument. "It was an exploration in my thesis project," said Nemes. 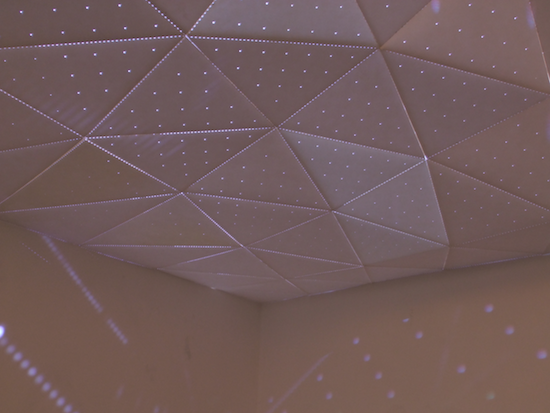 "The intention was to make an immersive space out of a ceilingscape using...a defamiliarization of space, scale, and material." After defining the curvature of the surface topology in Rhino, Nemes used Grasshopper to create triangular tessellations separated by perforations that "increase in diameter as the triangles increase in elevation, so the triangles at the top of the dome have the largest perforations." 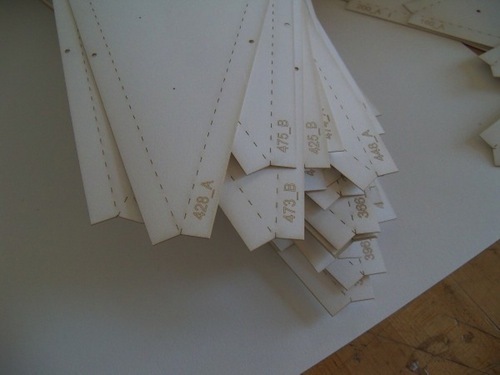 Nemes also used Grasshopper for unrolling, tabbing, labeling and packing the triangles onto sheets that were laser cut with a half-inch tab on all sides. With the help of friends, Nemes folded all the tabs and stapled them together into groups of 10-12. These grouping were then transported to the Gelman Gallery at RISD's Design Museum, where they were hung together with monofilaments and strung across the ceiling with four steel cables. It's hard to believe that the expansive and transformative ceiling installation was made from such humble materials. 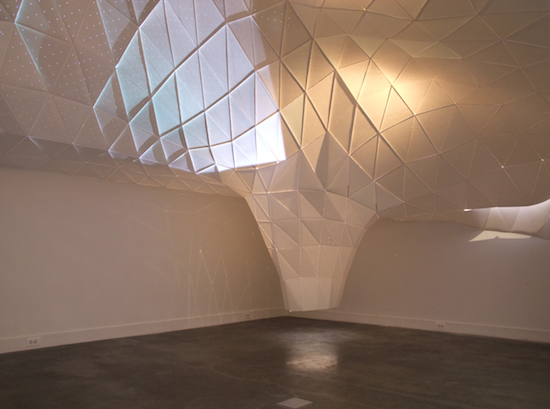 Though Encounter functions best when the lights are off, it speaks to Nemes' abilities as a fabricator, perhaps even as craftsman, that he was able to create an immersive environment with real architectural potential out of paper and staples. In total, Encounter measured 20' x 13' x 10,' filling almost the entire room. 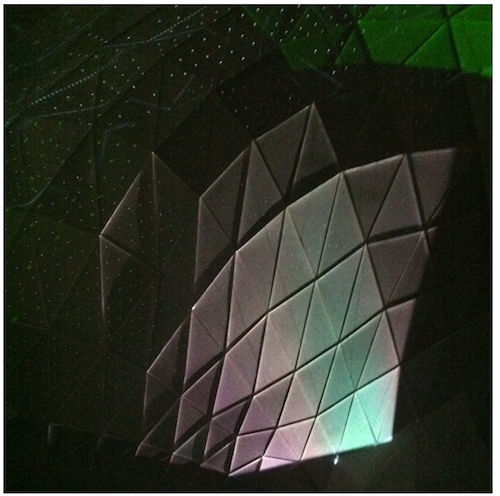 A small space was kept open for visitors to watch the light show Nemes created with a "computational color pattern to gradually affect the light and coloring of the space." It was shown using two projectors during a month-long exhibition called "Tickling Your Eyeballs." Watch the short video of the making of Encounter and see it in action. Etch-a-Desert. In the Peruvian desert, you will find artist Rodrigo Derteano’s robot scraping away at the dirt to create massive drawings. In an interview with Derteano, We Make Money Not Art explained, “Guided by its sensors, the robot quietly traced the founding lines of a new city that looks like a collage of existing cities from Latin America.” The drawing was completed over the course of five days, most of which the robot spent tracing alone. Have a closer look at the video above. (via BldgBlog.) The future is dead. National Geographic reported that the most recent algae bloom in Qingdao, China has clogged 7,700 square miles of the Yellow Sea. The insurgence of green goop, however, has not stopped children and families from taking a dip while at the beach, but as the algae dies and decomposes, a dead zone and fish kill is expected as oxygen is depleted from the water. Off to Jupiter. NASA sent three little LEGO figurines atop space probe Juno to visit Jupiter. Each LEGO person models a particular character: Galileo Galilei, the Roman god Jupiter, and the Roman goddess Juno. The figurines are made of aluminum and are expected to reach Jupiter by July of 2016. More at Design Boom. Resources at RISD. The Rhode Island School of Design just opened its Materials Library, a long-term student project focusing on design process and material interaction, according to Core77. It's hoped that designers will find a deeper appreciation of material through the tactile experience of holding them in their hands.